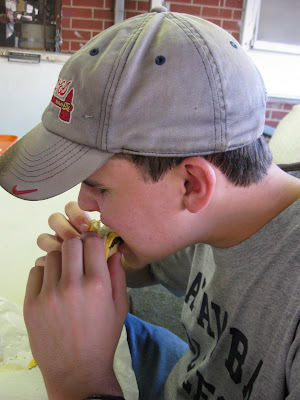 My son is really trying hard to get this barbecue burger down the hatch. Here, you can see the burger problem. This grilled burger is a hockey puck. It's not hot either, so the cheese didn't even melt. I had my eye on the Ragin Cajun Bayou Grill booth at the Rowan County Fair. The Ragin Cajun Cook was putting the shrimp on fresh to order, and that does make a huge difference. My grilled shrimp and rice dinner was fabulous. I did ask for "easy on the cheese," so expect more cheese generally. There is an art to getting a yummy meal at a county fair. There are some hits and some misses. It pays to walk around, keep your eyes open, and ask some questions. 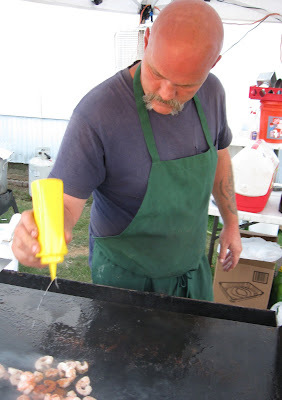 In previous years, we always got our dinner at the Optimist booth at the Rowan County Fair. My (now retired) boss is an Optimist (in more ways than this), and the food was always great. Sadly, the group is now smaller and the guys are older, and they gave the county fair food booth up after many years. I love county fairs, so I already knew how to find the good stuff. One way is to stick with what you know like the Optimists and the money going local. The other is to do a little research. Perhaps you are thinking that it's a drag to have to really think about what you're going to eat at the fair. If you get a bad meal, you may think again. County fairs are a mixed bag. You have some of the traditional carnival vendors that travel with the show as well locals who have spaces with the money going back to the community. Everyone needs to turn a profit, so it's great when all the food is terrific and everyone comes out OK at the end of the night. The food booths are usually grouped, and I will walk around and take a quick look. There are always a few foods that catch my eye, and then I have to narrow it down. I'd love to eat it all, but that gets expensive, and my jeans won't handle that kind of pig out. I will look at the cooking process at the booths I'm interested in. I will look at the food carried out by those buying. I will even ask someone at a table if the food is good. I have no shame when it comes to food. I want good food - period. 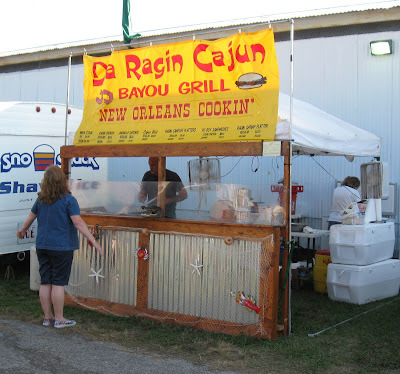 This year at the Rowan County Fair they had a new booth - the Ragin Cajun Bayou Grill. This is more like fry grilling which is fine. They were just getting the food up and going when we arrived. I especially love shrimp, and they had it. The Ragin Cajun guy said shrimp went on last, so it would be fresh and not rubbery. I hear that. If you cook shrimp too long or let it sit, then it is not very good. Even though I had not seen a plate come off and could not ask anyone if the food was good, I had a good feeling on this one. I waited. My son is not that keen on new foods, unless it's something I cook. He decided to go for a burger. Unfortunately, he could not see the burgers cooking (that was in the back), and he is not the type to watch and then ask folks if what they bought was good. He ended up with one of those gross hockey puck burgers. It was thin. It was cooked too far ahead. It wasn't even hot enough to melt the cheese. This was a $6 mistake. He was a good sport and got it down, but I sent him back to the chicken and dumpling booth where they were making good food. He was, as you can imagine, stuffed by the end of the meal. But, he did get something tasty and certainly not the burger. 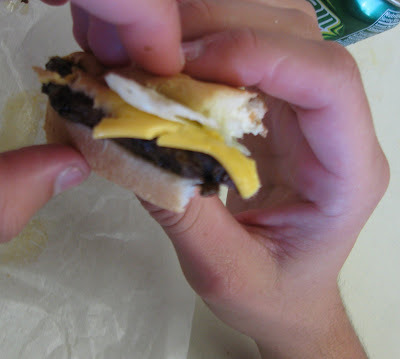 My Mom also got one of the icky grilled burgers. She is not one to be critical, but she said that the cheeseburger sure made my grilled burgers look good. I really hated that she got soaked on a bad county fair dinner. The kid and my Mom waited while I checked back with the Cajun guy. He was cooking up a storm, but it just takes a while. He gave me a taste of the steak when I checked back. Yum. That was good. I figured I made the right decision to wait. I think he was surprised that I didn't just go for something quick and ready. No. I'll wait if it's worth it. 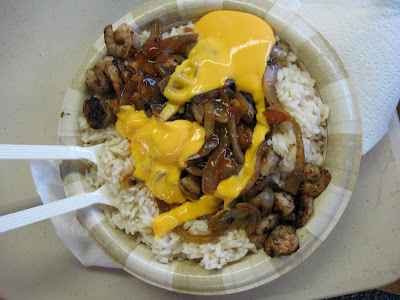 By the time my shrimp and rice was ready with "light on the cheese," Mom and my kid were done with the burgers. The kid was enjoying the chicken and dumplings which were top notch. I tried a bite. Someone knows how to do them right. I had my Mom take some of my shrimp and rice, so she got some good food too. You can get a great meal at a county fair. You can also get a disaster. That's why I look around and pay attention. I wouldn't complain about an awful burger when it's a local group with the money going to charity. On the other hand, I would not serve dry and cold burgers either. I'd do the burgers right or not at all - no matter where the money was going. That's why I scope things out. It really doesn't take much time. It's nice to chat with other folks - both those cooking and eating. In the end, I get a great county fair meal and no ick burgers with cold cheese.